Gold rose on the week while silver fell. U.S. Mint bullion sales surged for gold and silver coins. Gold closed higher for a second straight day Friday, notching its first weekly gain in three — albeit a modest one with a 0.2% pick up from a week ago. On Friday,gold for December delivery added $1.10, or less than 0.1%, to settle at $1,287.40 an ounce on the Comex division of the New York Mercantile Exchange. Its weekly gain came despite a five-session losing streak that lasted through Wednesday. The turnaround happened after comments from Fed chairman nominee Janet Yellen signaled support for the current stimulus program of the central bank. "It’s unlikely that (Fed chairman) Bernanke will do anything at his last meeting if he perceives that his successor would prefer to leave policy unchanged," Bloomberg News quoted Nic Brown, head of commodities research at Natixis SA in London. "The dollar may drop back, too. 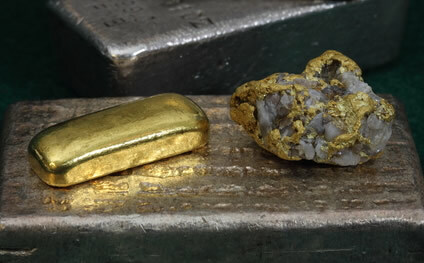 This is all potentially positive for gold prices in the very short term." Gold surveys last week were divided in price expectations for this week. New surveys are more aligned with a bullish outlook. "In the Kitco News Gold Survey, out of 34 participants, 25 responded this week. Of these, 10 see prices up, while eight see prices down and seven see prices sideways or are neutral," notes Kitco. "Market participants include bullion dealers, investment banks, futures traders and technical-chart analysts." Bloomberg News reports its survey has 18 participants forecasting higher gold prices next week compared to 9 who were bearish and 2 who were neutral. Silver for December delivery edged up a half cent to end at $20.73 an ounce. It also marked a second day of gains. On Wednesday, it had dropped for the ninth time in ten sessions. Silver prices tumbled 2.8% for the week and they have plunged 31.4% for the year-to-date. January platinum lost $5.20, or 0.4%, to finish at $1,438.90 an ounce. Palladium for December delivery declined $7.15, or 1%, to settle at $732.65 an ounce. Palladium has closed lower in six of the last seven sessions. Both metals declined on the week with platinum off 0.3% and palladium down 3.3%. Palladium is still higher on the year, up 4.2%, but platinum has lost 6.7%. The following grid summarizes precious metals futures for the month-to-date, the completed quarters in 2013 and the year-to-date. Directionally, London precious metals moved the same way for the week with gold advancing 0.1% while declines totaled 4.9% for silver, 0.6% for platinum and 3.7% for palladium. The following grid summarizes London precious metals fixings for the month-to-date, the completed quarters in 2013 and the year-to-date. Gold coins advanced 16,500 ounces compared to last week’s 10,000 ounces. Sales splits were 11,500 ounces in 22-karat American Gold Eagles, versus 9,000 previously, and 5,000 ounces in 24-karat American Gold Buffalo coins, versus 1,000 previously. Silver coins advanced 603,500 ounces compared to last week’s 535,000 ounces. Splits were 500,000 ounces in Silver Eagles for a second straight week and 103,500 ounces in America the Beautiful Five Ounce Silver Bullion Coins, versus 35,000 previously. On Tuesday, the Silver Eagles scored a new record at 40,175,000 for 2013 to date, passing the annual record of 39,868,500 set in 2011. Bullion sales for the week, for the month through Nov. 15, and the year-to-date are listed below. Melt values for silver coins are heading sharply lower for November so far, adding to steep losses on the year. The grid below offers current melt values of older circulating U.S. coins that were produced with 90% silver. These coins, at least those that have little to no numismatic worth because they are too common or too worn, are the ones often sought for their silver values. The above silver melt values are calculated using London fix silver prices at the end of 2012, end of October and on Nov. 15.